59515-PB is rated 3.5 out of 5 by 2. Experience a better shower with the control and flexibility of a Delta® hand shower. Great for showering yourself or your loved ones and pets, as well as for keeping your shower and tub clean. Designed to look like new for life, Brilliance® finishes are developed using a proprietary process that creates a durable, long-lasting finish that is guaranteed not to corrode, tarnish or discolor. The pause setting gives you ample space for shaving, lathering and other shower tasks, then easily restarts the water with the temperature where you left off. This spray setting helps you conserve water, so you can worry less about depleting your supply of hot water - and you help the environment too. Rated 3 out of 5 by Mikey from Works great The hand shower works great and was inexpensive. 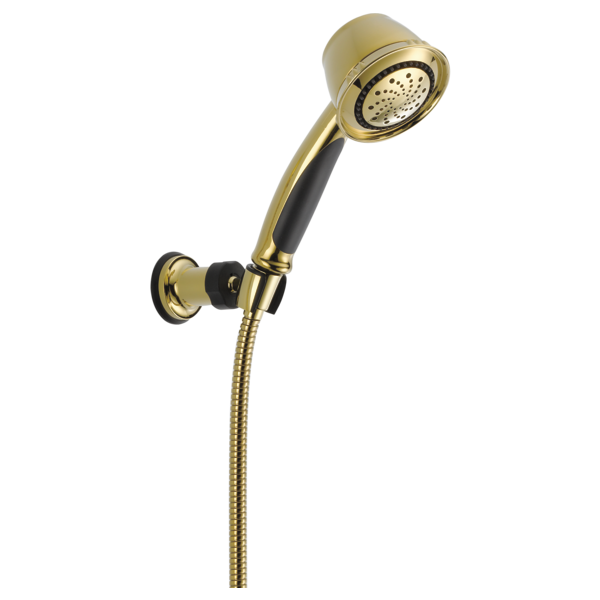 The reason for not rating the hand shower higher is that it is made of plastic and the "polished brass" finish is not quite right, but that is the trade off for the low price of the item. Rated 4 out of 5 by Nickie27 from Really love this showerhead I put this showerhead in my new shower and it seems to be of good quality. Sprays well, no problems. what is the face diameter? Thank you for your question. Delta Faucet model # 59515-PB has a face diameter of approximately 3-1/2 inches. Unable to find. What is the material of this unit made of ? I have this hand held shower, &nbsp;59515SS, which was installed in 2012, the hand shower does not stay in the mount very well. I was wondering if I could get a new NUT and MOUNT, that should solve my problem. I can not find a parts list.